Heat oven to 400°F. Line 15x10x1-inch pan with foil and a cooling rack. Add flour, baking powder, 1 teaspoon of the garlic powder and the salt to 1-gallon resealable food-storage plastic bag. Add wings; shake to completely coat. Place wings on rack in pan. Bake 35 to 40 minutes, turning once halfway through bake time, until lightly browned and juice of chicken is clear when thickest part is cut to bone (at least 175°F). Set oven control to broil. Broil wings 4 to 5 minutes or until skin is lightly crisped. Meanwhile, in small bowl, mix melted butter, remaining 1/4 teaspoon garlic powder, the Italian seasoning and 2 teaspoons of the Parmesan cheese. Brush wings with butter mixture; sprinkle with remaining 4 teaspoons grated cheese. Transfer to serving platter; top with parsley. Adding baking powder to the flour mixture helps wings get crispy in the oven. Cooking wings to 175°F ensures meat will easily come off bone. 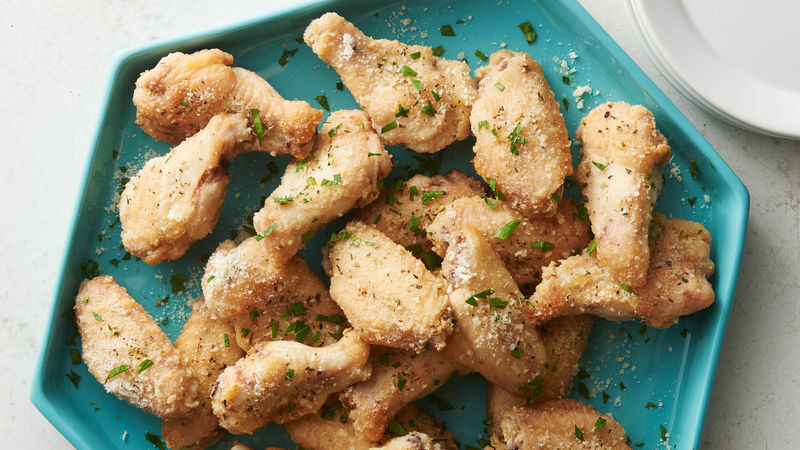 These garlic parmesan wings are proof that chicken wings don’t have to be drenched in oil and deep-fried to be exceptionally crisp. What gives these oven-baked wings their crunch? Two words: Baking. Powder. The mixture of sodium bicarbonate, cream of tartar and cornstarch present in baking soda combined with the high temperature of the oven results in golden-brown, crackling wings. Just make sure you’re cooking with baking powder (not baking soda) and that your oven is fully preheated to 400 degrees before popping the wings in. Otherwise, your chicken may not reach its full-crunch potential and that would be a shame. If you like these wings, we bet you like bbq chicken wings too. They’re just as addictively tasty and easy to prepare.